I have never once played a single version of "Angry Birds." I've seen people play it before, and I certainly know its popular among little kids. When I first started working at the daycare I work at today, all some kids could talk about was "Angry Birds" and how awesome it was. Some of them even had "Angry Birds" toys and shoes. I have certainly heard of it, and I understand the mechanics of the game, I just have never really played it. What was curious to me was how they would turn a video game that barely registers as video game into a feature film. 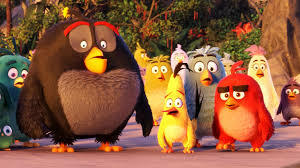 I have to say that I was pleasently surprised by "Angry Birds" the movie. Its not the best movie of the year by any means. Its light-hearted fluff, like most animated films geared toward children. But so much of the film is so clever, so funny and so confident in itself that its hard not to really like it. The animation is some of the most rich you're likely to see in a theater at the moment. There are also some good actors who have come forth to lend their voices. Jason Sudeikis does the voice for Red, a bird who lives in a island utopia for birds who don't fly. In this story, birds don't fly because the lives they have are so perfect that they need not go anywhere. There is also the ancient protector Mighty Eagle (Peter Dinklage) who protects the island. Red seems to be the only bird who is easily agitated by his everyday life. Red is a lot like the character Paul Rudd played in "Role Models." He sweats the small things, and he allows the small things to ruin his day. This gets him in trouble with the law of the land, and he is forced to attend anger management courses. Red befriends Chuck (Josh Grad) and Bomb (Danny McBride). Meanwhile, a colony of green pigs arrive on the island, offering friendship. All the birds welcome the pigs with open arms, except for Red, who doesn't trust them. Red enlists the help of his new friends to investigate the green pigs, who have sinister plans for the birds. "Angry Birds" takes the familiar Disney concepts of becoming a hero and overcoming a gleaming obstacle, but updates it in a fun way. Red isn't an angry character simply because the movie needed him to be, there are some things that happened in his life that made him that way and I liked that the movie took its time to develop its characters. I was surprised that a lot of the comedy of the movie lands well. Sure, there are some moments where I feel the film tried a little too hard, but sometimes that happens. Its not glaringly obvious. I was blown away by the random nod to Stanley Kubrick's "The Shining." Yes, I am sure parents got it and laughed. But just like the "Pulp Fiction" nod in "Space Jam," why is that kind of joke in a kids movie? What I am sure kids and fans of the game will really enjoy is at the movie's climax, there is an actual "game" of Angry Birds. Yes, the birds unite to save their kidnapped children from the pigs, and the way they fight to get their kids back is through launching themselves at the pig capital on a massive slingshot. You can't downgrade a game adaptation that actually utilizes the inspiration. Sure, it felt weird in "Battleship," but there was so much wrong with that movie in the first place. I really enjoyed that the game was actually apart of the plot. "Angry Birds" feels like a little more than just a quick cash grab. Sure, not all the comedy works and sure the storyline plays it a little safe. But ultimately, I had a huge smile on my face for most of the movie. This will be a fun one to enjoy with your kids.